1. Why do I get no pictures since I changed my "Blue Cap" LNB for a new one ? 2. My receiver is stuck in standby. Is this Parental Lock Mode ? 3. Some channels are sparkly. How do I tune them in? 4. I can't get 6.60 Audio channels. Is there an upgrade ? 5. How can I get more channels ? 6. Is there a factory reset ? 7. Why do I get poor pictures with wavy lines ? 8. Why do I get a blank screen ? 9. Can I use a Remote Control with my SRX100 ? 10. What is the 15-way socket for? 11. Can you supply a User Manual? 1. Why do I get no pictures since I swapped my "Blue Cap" LNB for a new one ? Perhaps you short-circuited the coaxial cable inner wire to the outer plug. Check the connections very carefully to ensure that strands of wire are not causing a short circuit. Locate the front fuse F503. Replace it with a T1A fuse. whether R532 (15R, 2W wire-wound) is open circuit. This resistor is located in front of the left hand heatsink. Q505 and Q506 may also fail. No. The SRX200 doesn't have a Parental Lock. You have a faulty button or a power supply fault. 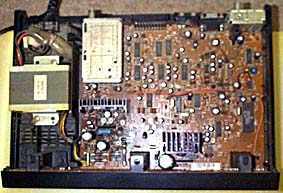 There is a frequency offset adjuster which is located inside the receiver at the right hand side. It is marked "OFF SET". Turn this adjuster to its central position to begin with. Turning it one way will reduce black sparklies and turning it the other way will reduce white sparklies. It reacts very slowly so give it time. It should be set for the best compromise on all channels (usually middle position). If black sparklies are present, press [tune up] then immediately press [H/V]. If white sparklies are present, press [tune down] then immediately press [H/V]. Once you have a good picture, press [Preset] twice. The dish is not aligned. The cable is kinked, has moisture inside or bad connections. The receiver tuner module is faulty. Yes there is. It's a small circuit board assembly with just three wires to solder in place. You can adjust it to get either 6.50, 6.60 or 6.65 MHz audio channels. However, if you leave it adjusted to 6.60 MHz it will receive the other two with only slight distortion. You can buy it from me or from several other stockists. It comes with simple fitting instructions. The 6.60 MHz audio channel can be selected simply by pressing the [TV/SAT] button. Alternatively, if this is in use, you can connect a manual switch instead. If your receiver has only 16 channels you can fit the microprocessor IC from a later model or from an SRD400 and get 48 channels. 7. Is there a factory reset ? No, there's no secret button sequence but you can solder in a new SDA2516 EEprom. This will automatically be reprogrammed to factory defaults on power-up. 8. Why do I get poor pictures with wavy lines ? This is usually caused by electrolytic capacitors overheating. Replace C504 (220uF) in front of the left hand heatsink. If this does not help, replace the 100uF capacitors around the tuner module. Replace them one by one, testing each time, and be sure to fit them the correct way round. Replace C704. 9. Why do I get a blank screen ? Someone may have fitted an incorrect fuse which has melted. The front fuse should be a T1A; the rear fuse is T1.25A and the right hand one is a T2A fuse. You can add the necessary parts to the front panel. Fit the Infra Red sensor OS101, R168 (47R) and C152 (100uF). Be sure to scrape the paint off the inside of the front panel moulding "window." You can obtain these parts from me or from a scrap receiver. I am currently living in Gothenburg, Sweden. I have recently aquired an old BSB dmac squarial of which I would like to use only to receive radio from the analogue astra group through an equally old Amstrad SRX100. I understand the squarial is RH circular polarised so I need to convert it to the HV type. The principal reason for all this bother is the need for a very small and flat receiving dish where it shall be used. Alternatively could you suggest any low budget options. I haven't seen a "squarial" for 8 years but I can confirm that it is circular polarised and I believe the "LH" could be changed by swapping over a film inside? Never done it so it means nothing to me. You can't, of course, convert the matrix to H/V. Small square antennas are never "low budget" options. If you want "smaller" then you pay a premium for optimised performance. Technisat sell a very expensive square antenna - or used to. You could paint it so it looked like a fold-up table. BTW, if you use a smaller-than-normal dish, you will need a *very* sensitive receiver to compensate. An SRX200 with a tuner threshold of 8dB does not fulfil that requirement! In addition, it is unable to tune all the available audio frequencies.